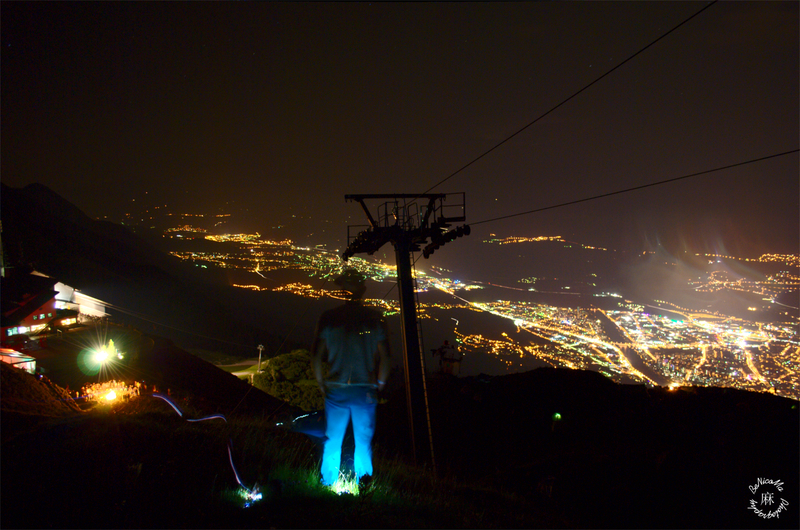 The Nordkette Wetterleuchten Festival is a cosy open air on Seegrube (1905 m) over Innsbruck. You get two days of electronic sounds, served with THE VIEW, down to city and far into the Alps at night. A truly amazing experience! This year’s Alps Festival Wetterleuchten has been stunning! The weather was stable and actually perfect, with true Wetterleuchten – thunderstorms seen from the distance – over other regions of the Alps. There have been two tents with great, bassy electronic beats, in the bigger tent mashed up with some classics from time to time. Sound was great and dancing actually lots of fun! Everywhere you go up there, you find the tents of the people who stay there over-night. A mild night with around 18 °C on 1905 m, pretty warm and comfortable. The big campfire, chillout and warm-up while the bass vibrates in ears and body. The whole festival at a glance. You can see some of the tents in the middle, great place to sleep. The big campfire, chill and warm-up while the bass vibrates in ears and body. A closeup of Innsbruck never hurts. I love the mood up there and it makes this city unique! Last weeks report was about Stubai Valley, Hiking along the Innvalley and Lake Obernberg. This week is about two touring areas – with plentiful individual tours – the areas of Sellrain Valley and Isar Ursprung Valley. The Photography give you an impression, what kind of nature is waiting for you to get discovered. Last weekends Hiking Special Tyrol – Part 1 gave a short introduction in possible tours and regions for supreme hiking, before the winter break and this is why Part 2 already follows this weekend. Innsbruck (Part 1 & Part 2) is a great basis to start your journeys. It is very likely that you will still be able to go some rounds in the late autumn, before the winter reaches the lower valleys. In the meanwhile you can enjoy snow covered summits, awesome weather and green meadows in contrast to those white tips everywhere. The Sellrain offers several valleys which terminate into the main valley. If you go up there to the top, you automatically reach the skiing and summer resort Kühtai. If you leave the valley earlier into one of the several side valleys you will reach a nearly untouched hiking ground, where you can park your car pretty close to the forest. And mostly you reach deep forests, which open up in higher altitudes, where you can find beautiful Almen and granite rocks in the highest altitudes, close to the summits. The autumn colors have been stunning and a great contrast to the evergreen (or white) meadows of the Stubai Alps. Those are blueberry bushed and their leaves are all colored in red during fall season. We had a great tour about four weeks ago in the side valley leaving Gries im Sellrain. My Tyrolean friends have a little hut in the mountains and up there, hidden in the forest, you are nearly alone, when you go out in the plains. And that’s the way I celebrated when we reached the summit. It’s probably a very nice ski touring ground as well – for all recommended entries, have a look here. Make sure to check on the risks for avalanches and enjoy a secluded mountaineering paradise! More pictures can be found in the attached gallery. If you have time and it’s earlier in the season, you could surpass the whole first ring of Karwendel and go a tour from Scharnitz to the Achensee close to Jenbach. It is a three day tour, if you plan with about 10 – 20 km trails per day. You walk by Innsbruck, but it’s hidden on the other side of Karwendel, soutwards of you. This is the view, when you access the valley, in the back the hiking trail spread out and you have several options for great tours. And the following picture is taken inside of the young Isar. It is a pretty cold river, let this be said. The Isar springs are in the mountains of this region and this river goes all the way up to Munich and passes Bavaria’s capital, as one of Munich‘s sight, since the Isar Auen are a great place for recreation in summer time, for canoeing and all sorts of paddling sports with little boats. We chose a trail towards the Scharnitz Alm, where you can go all the way into the first high valleys of Karwendel, behind Nordkette and soon reached the first deep forest. A beautiful forest, dense and full colored under the influence of Autumn. But you still find green spots, hidden in the forest. The ground is covered with moss in many parts, the nostrils are filled with an uncomparable smell of nature, when you make your way upwards. If you make your way deep inside of this fairywonderland, you become hungry. This is our Jause, we enjoyed with an uncomparable view. We met in total maybe 6 people on our tour, which lasted for about 4 hours. Here you can see the wonderful October colors in contrast to the reddish grey rocks of the big mountains. The water passing through those mountains, eating itself into the rock, has a light turquois color, it is really pure and cold. You find more images attached in the gallery. With the provided information you have something on hand to plan your trip, you should definitively reconsider this, while you are around between May and Mid of November, depending on the weather. Being in the #clouds is a very special experience. This little #hut on the #Nordkette of #Innsbruck has to face all #weather conditions during the whole year. I like it since it was built of #cobblestone from the #mountain it stands on. It's a typical example for how #houses in the #Alps are built. And when you are on the summits of Nordkette, like the Hafelekar, you have a wonderful look inside of this region as well! These are some views from the Hafelekar and the Hafelekarbahn up to the summit! Innsbruck has plenty of great sites, summer as winter. It’s up to you to decide what you would like to experience. Outdoor is a great plus but the museums of the city draft in thousands of tourists as well. Have a look into this entry to find your personal and suitable experience. I want to start this entry with a little story about the people living here in most beautiful Tyrol, Austrias highland. The Tyroleans are a very special kind of people. If you approach them too open minded and loud, before they can flee, you can be prepared for a reply which can be harsh sometimes, or at least sarcastic. Foreigners, especially the ones living permanently in Tyrol, like Germans, are not always welcome to them – Germans in particular are a matter of a longterm love hate relationship. The term for Germans in Austria is “Piefke” which goes back to a story of two officers on the Prussian miltitary squad of the old times, before the Nazis took over Europe. They were so in shape, that they defined this term as typical German (towards the Austrian mentality). It might be due to the success of Germany in football, olympics, industry etc. while speaking the same language, it might be due to the size of Germany and amount of Germans, or because of the lively, self-confident (overexaggerating sometimes) appearance much more Germans have compared to Austrians, who are almost ever much more relaxed and laid back – even if they are equally qualified for what they do. I started to love this kind of attitude, it’s “just being relaxed” vs. being permanently stressed out and hasty in your everyday life… So this is by any means critics on the Austrian mentality. If you befriend with those guys and they go to the mountain with you, be sure you have found friends which understand this meaning from the heart. This is the Tyrolean “National Anthem” if it comes up to the Tyroleans in Tyrol, East Tyrol and South Tyrol (Alto Adige), it should be still a united country, without Alto Adige belonging to Italy. But this entry is to bring the sights of Innsbruck to you, who are probably not living here, who are planing to do an unforgettable vacation in the Alps. Innsbruck is a tremendous base for your endeavours because you have lots of great restaurants and entertainment on the one hand and top notch skiing resorts or hiking on the other within an hour in your car or by public transportation. Rank 10: Plenty of Chinese and Japanese visitors rush in every day and it’s a main sight of the city, the Swarovski flagship store with its crystal exhibition in the center of the old-city. The company is actually a Tyrolean family owned company and does precision glassware for analytics and optics besides the jewelry. The main facility is in Wattens, just a 30 min. busride away the Swarovski Kristallwelten in Wattens. As I mentioned in my last entry about Innsbruck, this is nothing we would attend to, but I know there is big interest in these exhibitions, so it’s worth to mention them here. Rank 9: The inner city of Innsbruck itself is a sight. You will have this panoramic view nowhere else while you go shopping. It includes the old-city itself, with the well known Goldenes Dachl, which I grant the Rank 5 in this listing. It includes the colorful houses along the Inn, the Dom (the main church), the Stadt-schloss, Landestheater, Hofgarten and everything related. The city shines in its beauty and this is based on the fact that it was not destroyed during WWII. 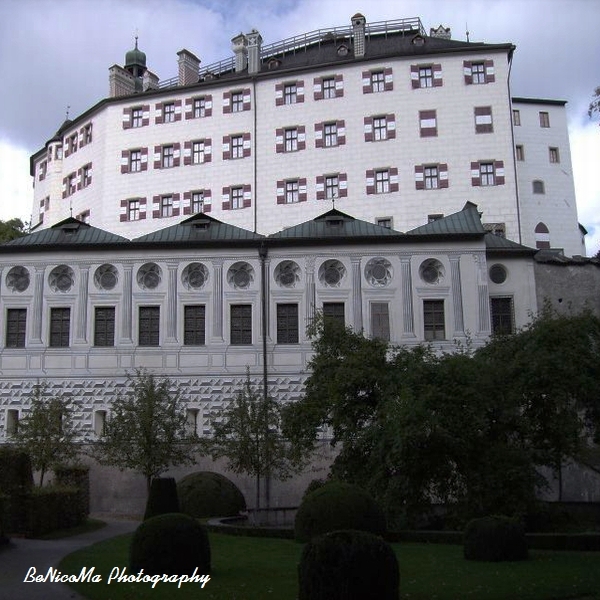 Rank 8: Schloß Ambras and the Ferdinandeum, the lovely Tyrolean museum for history are going places when you are into history and old stuff, which is exhibited there. The castle is lovely and the garden beautiful. The Ferdinandeum is quite modern but the exhibition still has its charme. Rank 7: Another main sight of the city is the Bergisel Schanze where the olympic wintergames took place. It’s annually used as venue in the tournament of the Vierschanzentournee, as I reported in my last entry. Another curiosity is the Wok WM, which was hosted by the German host Stefan Raab during the last years. A crazy tournament for crazy people, who enjoy a race down the bob-trail on a heated wok (yes the cooking device). Rank 6: The zoo of Innsbruck, better known as Alpenzoo, is a nice place for families and animal enthusiasts. The inhabitants are all living in the Alps, so get a good overview which kind of animals can be found here, when you wander off the beaten tracks. Capricorn and eagle are the most prominent inhabitants, but bears, wolves and bobcats can be found there as well, and of course the otters, which have been my personal favorite! Another great sight is the botanical garden of the University of Innsbruck – small but well organized and the entry fees just apply for the tropical houses, visiting the garden with the flora of the Alps is totally free of charge! Rank 5: The main sight depicted on all the postcards from Innsbruck is the Goldenes Dachl (golden roof). There is not much to say about it, it’s simply beautiful and you should stop there and take your touristic photo souvenir, when you pass it. It gets a separate rank, because it is the symbol of the city. Rank 4: Compared to Salzburg or Kärnten there are just few lakes where you can go to dip on hot summer days. But some of them are most beautiful and I want to mention them here as one “sight” because most of them are in close range and easy to reach. The most beautiful lake around the area is Lake Obernberg, it is not allowed to swim in there, but we were never punished when we took a fast dip after we hiked the surrounding mountains. Another great lake is the Achensee, which you reach by car going via Jenbach, turning northwards up into the mountains. You can even sail on this lake and (kite)surf in summer, in winter you find a school for snow-kiting. The two most beautiful swimming lakes in the surrounding of Innsbruck are the Reintalersee in Kramsach and the Piburger See in the Ötztal. In the Ötztal you find the Area 47, a water themepark for your amusement and plenty of opportunity to do rafting and canyoning. Rank 3: The endless amounts of skiing resorts in the region are a major sight for your activity and your exploration. I will just recommend the best of the best to you and not give you info on the smaller ones. Leave those to the locals and the guys who tend to be alone when they do their sports. If you are interested in touring skiing you can ask me for those via the comment section, albeit from that, stick to the ones, which offer your daily dose of convenience, apres ski and awesome. For the following list, I do not have a special ranking. Ischgl, Arlberg, Zillertal, and Serfaus are huge, the rest is smaller and some are closer to Innsbruck. Rank 2: The Höttinger Alm is an easy to hike hut, which you should visit when you are in good shape during the summer month. You can reach it in a two hour hike via easy routes and the food is fantastic! You have a great view on Innsbruck and it is my personal favorite, when it comes up to traditional huts and the mountain flair. Rank 1: The Nordkettenbahnen are the main sight in my opinion and they bring you up to 2300 m of elevation to the Hafelekar right over the roofs of Innsbruck. This experience is so unique, no matter if it summer or winter, it has to receive rank 1. You can jump in there, like into a metro and right from the old-city of Innsbruck, go up to Hungerburg, from there by cable car to Seegrube, and from there up to Hafelekar with just another cable car. It opens a playground for adventurers, skiing experts (yes, experts!) in winter, and mountainbike freaks (yes freaks!) in summer. You find an awesome climbing trail and plenty of opportunity to live your personal experience of wanderlust. If you are not into those sports regulary and very experienced leave this place out and just go up to enjoy the view – you can do that every Friday in summer til 11:30 p.m. and in winter til 1:30 a.m.! It’s in your own interest to not overestimate yourself because otherwise you just hurt yourself and are brought down to the valley in a helicopter. I mean it like I write it, please don’t overestimate your skills here. I have to mention the Patscher Kofel as well here – just for completeness and without taking rank 1. It’s by far not as impressive as the Nordkette, but the views on Innsbruck, the Nordkette and the Innvalley are more than beautiful as well. If you have few time, do just the Nordkette, if you have plenty do Patscher Kofel as well and hike the Zirbenweg. Part 1 of my introduction of my home Innsbruck is all about the lifestyle, what you can do and where you can go at night. I give you recommendation on what to obey and where to inform, when you plan to hit the mountains. In the upcoming second part I will give the more basic info like touristic sights and going-places. The Innsbruck “skyline” with the dome and clouds from an incoming thunderstorm. Most people associate Innsbruck and Tyrol with wintersports or ridiculously green meadows on the mountains during the summer time, where you can give credit to your Wanderlust. The term cultural capital is of course not comparable with the likes as the opera in Verona (Italy), Wagner in Bayreuth (Germany), sights in Vienna (Austria), and the tons of great entertainment Berlin (Germany) has to offer, it is a small city after all – but you should not make the mistake to compare those names with each other and the main “sight” is nature and the mountains of the Alps. I will give you more information on the touristic important sights of Innsbruck and the surrounding area in my next entry – part 2. For us, who live here, those sights are playing a minor role of course, but when you are here for the first time, you should definitively check them out, since they characterize this place and give it a special character. Anyways, there have been several great artists coming to Innsbruck over the last years since I live here and for some reason Innsbruck seems to be an important place for those artists on their way up to a bigger career. I was able to see the Blood Red Shoes, The Cinematics, Portugal the Man, Steaming Satellites, Blumentopf, and just last year Milky Chance live, and there are always great gigs every now and then – impressive for a city of this size – as of last with more and more popular DJ Sets like one of my favorites Worakls. A huge advantage are the relatively small stages where you get in touch with artist and mood much closer than on those huge stages, like in New York (I saw Placebo there), Berlin (Fugees, 50 cent), Munich (Lana del Rey) and other big cities. Another advantage is the relatively low entry coverage, if the concerts aren’t for free completely. The boys and girls from BONANZA do a great job as well, since they brought an open air to Innsbruck, which has always a great line-up and during the summer month they entertain us at the Inn, playing decent electronic beats for free – the place to be on Wednesdays to enjoy your well deserved after work beer, having a BBQ and chillout to Electronic music! For a relatively small city there are plenty opportunities for nightlife! I will just give you a selected selection of great bars and clubs. My favorite bar is by any means the Café Moustache. You can already go there in the afternoon for a very good Falafel and at night chill-out to good music, meeting friends, with a beer that is absolutely fair priced and enjoyable in the surrounding – team is cool as well! The Club Aftershave is related to the Moustache and always worth a visit in season, when the students are present. We had fun nights down there! For live music the Weekender is the address to be. Most of the concerts I attended have been there and they offer free concerts of upcoming artists on Mondays during the semester, a great service! Good bars to start into the evening are Innkeller, Zappa, Treibhaus – known for the big variety of cultural program – and Prometheus (Proml), when the cafés close at 2 a.m. the Limerick Bill’s Irish Pub and the Babalon. Another Irish Pub, to watch football and enjoy good German beer, is the Galway Bay. The nightlife takes part in different locations, on one hand the “Bögen”, where you find my favorite clubs the Project, the p.m.k. – if you are interested in culture, gigs, concerts and acts, the Bäckerei with a focus on cultural program and products from the region and the Tante Emma, a classy cool nightclub which is open until sunrise. A little further off the track is the Club Cubique, where the well known DJs attend for sets in town. And last but not least there is a relatively new “underground” location Kindergarten, quite cool and in the modern style of an abondoned place – they don’t have a website, it’s “underground” and nightlife takes place to special events. A special and unique location to celebrate, aprés ski and enjoy life is Cloud9, which is nothing more than an iglu on Seegrube in winter time, where you can celebrate Wednesdays and Fridays – I say, this is the coolest (in the true meaning) location you can find! Lawine to check the dangers and risk of avalances in certain regions – I recommend to train the awareness in the SAAC course (link above), when you have not done it before! You can explore everything of course without the need to visit events, museums and sights. At least not with a city of this size right to its feet. And when you are in good physical condition, have respect for the mountains and want to experience a fun thing in summer, you should go hiking and check out boulder running – the fastest way to get down the mounain after you hiked it up. I will deliver a second report from my home and bring the main touristic sights to you and a little outlook, what you can and should do as daily tours, when you are here, stay tuned!